Biological fungicide for resistance and residue management. A preventative biofungicide for the suppression of fungal plant diseases on crops as specified. A biological fungicide for the suppression of powdery and downy mildew on table grapes and powdery mildew on cucurbits. Ideal in IPM, zero-residue and resistance management programs. Amylo-X® is compatible with most fertilizers, adjuvants and pesticides but if uncertain check with your Madumbi Technical Advisor before making tank mixes. Do NOT tank mix with copper based pesticides. Avoid the use of silicone spreaders (spreader-stickers and oil-based products are preferred). Avoid extreme pH (between 6–8 is optimal). Broad spectrum biofungicide containing the active ingredient Bacillus amyloliquifaciens isolate D747 supplied by Certis USA. No Maximum residue limit (MRL). Stable formulation with 2 year shelf life at room temperature. Well researched product of high quality delivering consistent results. Ideal resistance management option for IPM programs. Good efficiency and low risk of resistance build-up. Ideal resistance management option in IPM program with conventional chemicals. Suitable for use in organic production. Helps growers meet demands of export markets in terms of minimal/zero residue pest management programs. Limited risk of expiring stock and more consistent results. Production of antimicrobial metabolites: Amylo-X® is capable of producing a number of antimicrobial metabolites such as Iturin and Surfactin which inhibit growth of fungi and bacteria. 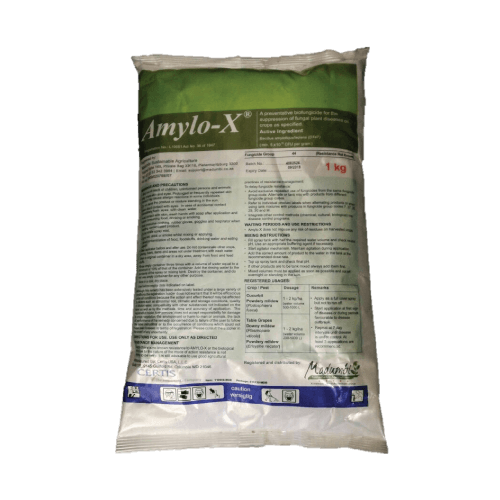 Competition for space and nutrients: Amylo-X® colonizes plant surfaces, occupying space and using up nutrient sources at potential infection sites thus making it difficult for pathogens to get established. Systemic Acquired Resistance (SAR): Amylo-X® can help activate a plants natural defence mechanisms through SAR. SAR is a state of enhanced immunity to infection demonstrated by plants following an injury or presence of inducer organisms like B. amyloliquefaciens (B.a.). 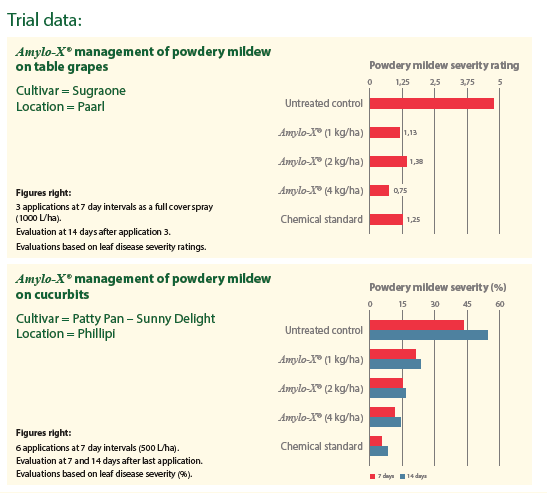 Amylo-X® management of powdery mildew on table grapes Cultivar = Sugraone Location = Paarl Figures right: 3 applications at 7 day intervals as a full cover spray 1000 L/ha). Evaluation at 14 days after application 3. Evaluations based on leaf disease severity ratings. Amylo-X® management of powdery mildew on cucurbits Cultivar = Patty Pan – Sunny Delight Location = Phillipi Figures right: 6 applications at 7 day intervals (500 L/ha).Evaluation at 7 and 14 days after last application. Evaluations based on leaf disease severity (%).